How do I view a usage report on an email template? 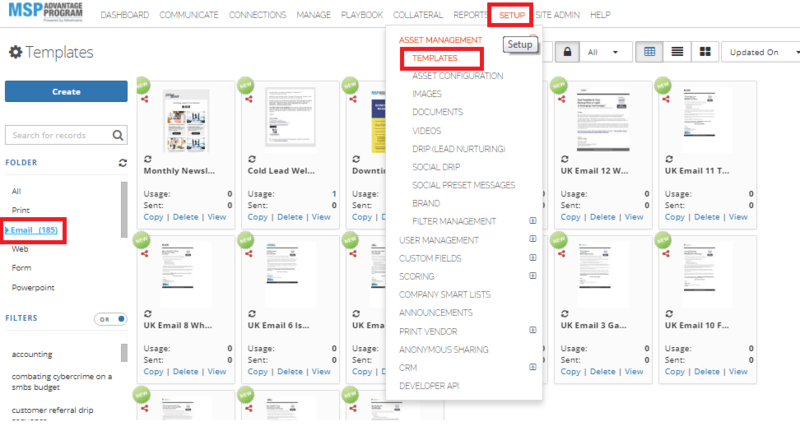 A usage report will show you how many of employees are using the email templates created in the Setup section. To access a usage report click on Setup, then select Asset Management, then Templates and then select “Email”. Check the usage and sent numbers on single templates. “Usage” shows the number of individual employees using this template, “Sent” shows the total number of emails sent using this template by all employees. To view a report on how often individual users send this email template to their lists and how well potential customers are responding, click on the usage number. The Status and Activity graph show how often potential customers open the template and click on links within the the template. You can view their activity on a daily, weekly, monthly and yearly basis. Below the graph are boxes showing the total number of employees who have used the graph,the total number of emails sent using that template, the number of emails opened, and the number of links clicked. Total views and clicks are in parentheses, while unique views and clicks are listed outside the parentheses. If you click on the open rate or click rate, you can check on whether or the users who sent the report, view their open ratio, click-through ratio, subject line they used, and the last date the email was sent. To download a spreadsheet of users and number of times they used the asset, click the export button.